CSS staff conducted formaldehyde exposure assessments in support of the Formaldehyde Exposure Surveillance Program at the National Institutes of Health (NIH) in Bethesda, MD. With the goal of reducing exposures to personnel that handle the chemical in laboratories, the evaluations included both qualitative and quantitative exposure assessments. During the qualitative assessments, the research protocols, equipment and plans were reviewed to estimate the risk of exposure. The quantitative assessments involved personal and area monitoring to further characterize exposures. 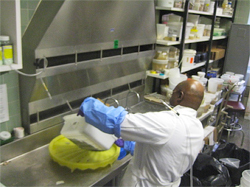 Based on the findings, several operations, such as tissue disposal and processes involving dispensing and transfer of formalin, were modified to minimize airborne exposures. Modifications included changes to the procedures and equipment, and upgrades to personal protective equipment. Planned laboratory renovations included consideration of engineering controls that will reduce employee exposure.